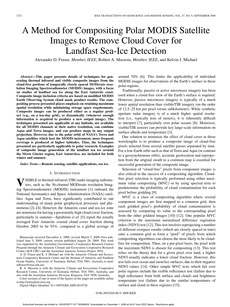 This paper presents details of techniques for generating thermal infrared and visible composite images from the cloud-free portions of temporally closely spaced MODerate resolution Imaging Spectroradiometer (MODIS) images, with a focus on studies of landfast sea ice along the East Antarctic coast. Composite image inclusion criteria are based on modified MODIS Earth Observing System cloud mask product results. The compositing process presented places emphasis on retaining maximum spatial resolution while minimizing storage space requirements. Composite images can be produced either as a regular product (e.g., on a ten-day grid), or dynamically (whenever enough information is acquired to produce a new output image). The techniques presented are applicable at any latitude, are available for all MODIS channels at their native resolution, can combine Aqua and Terra images, and can produce maps in any output projection. However, due to the polar orbit of NASA’s Terra and Aqua satellites which host the MODIS instrument, more frequent coverage is produced at higher latitudes. Thus, the techniques presented are particularly applicable to polar research. Examples of composite image generation of the landfast sea ice around the Mertz Glacier region, East Antarctica, are included for both winter and summer. Remote sensing, satellite applications, sea ice.